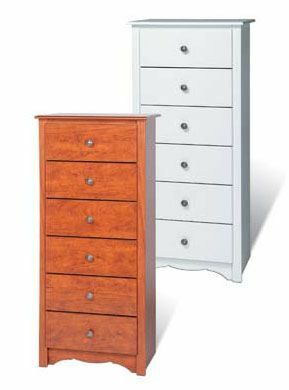 More on the Prepac Monterey Collection 6-Drawer Lingerie Chest (Cherry or White) C-2354 below. A "tall-boy" design for maximum storage with a minimal footprint, fitting easily in small spaces and rooms. All metal drawer glides for smooth, reliable movement. A profiled top-shelf and arched kick plate. Dark, pewter-finished, solid metal drawer pulls. Available in a cherry or white finish. *Also available in black or maple, as part of Prepac's "Sonoma" collection (model #DC-2354). See "Related Products," below, to preview other "Monterey" pieces.